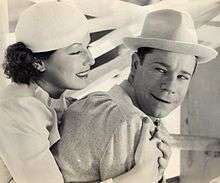 Earthworm Tractors is a 1936 American film directed by Ray Enright and starring Joe E. Brown and June Travis. The film is also known as A Natural Born Salesman in the United Kingdom. This film is based on characters created by William Hazlett Upson. He wrote stories for Saturday Evening Post and introduced Alexander Botts, A Natural Born Salesman, and The Earthworm Tractor Company (based on his previous work with Caterpillar Tractors) in 1927 which lasted until his death in 1975. In this slapstick romantic comedy, Alexander Botts is egged on by his sweetheart Sally to do great things, so he writes a letter to the Earthworm Tractor company, and is hired as a salesman. He gets fired more than once, but is rehired by getting orders. He falls in love with Mabel, daughter of cranky Sam. Eventually he proves a super salesman by selling many tractors to Sam, and wins Mabel's love. ↑ Variety film review; July 29, 1936, page 14. ↑ Harrison's Reports film review; July 25, 1936, page 119. Wikimedia Commons has media related to Earthworm Tractors.